On good days, when I’ve been consistent with my moisturizing routine, my hair feels like a fluffy, cotton candy cloud of 4B deliciousness. A coif that invites daylight to frolic through each strand, creating thousands of sunshine infused smiles for anyone who crosses my path. On bad days, friction caused by particles in the wind could ignite my hair, transforming the dry tumbleweed bush into a supernova ball of fire on my head. Over-styling and time constraints can impede my attempts to allocate enough time for my mane’s upkeep. Thankfully, I have a few go-to remedies to keep my hair feeling conditioned and healthy with minimal effort. This hair mask recipe works well for all hair types, from thicker and more coily to more thin and straight. This mask provides the best results when used after shampooing your hair. But it’s also a nice step prior to shampooing. It’s totally up to you and based on your preference. My preference, especially when my hair dry beyond belief, is to use this mask after washing. I also use it as an overnight mask once a week, which helps to keep my type 4B hair moisturized. Depending on your geographic location and hair's porosity, you may want to make minor modifications to this recipe. I will list my suggestions after the application process. Please remember to do a skin test before using this mask on your entire head. If you have any known skin irritations related to any of the oils listed, please feel free to swap them for one you prefer. This is also a small portion “tester” recipe, minimizing wasted ingredients. We'll be using the following ingredients in an oil infusion. These are a few reasons why they're so amazing for your hair and scalp! One of the best oils at penetrating the hair shaft and helping your hair retain moisture. This moisture retention softens and strengthens the hair. This oil is rich in oleic and linoleic fatty acids. The powerful antioxidants contained within this oil do an amazing job of healing hair that has been damaged from UV rays, and heat damage from styling tools. A ricinoleic amino acid that is full of Omega-6 and Omega-9 fatty acids. It locks in moisture, reduces frizz, and gives the hair follicle a smoother appearance. Can help maintain hair length and help reduce the appearance of dandruff. Contains caprylic acid, lauric acid, and capric acid. It has amino acids and is high in vitamin A, E, K, and D. Acts as a moisture sealant, restores shine, and conditions the hair. Helps with scalp health maintenance. Available in the bulk herb section at your local health food store, this antioxidant has silica that assists with collagen formation, helping to strengthen damaged, weak hair. There are also a host of minerals, manganese, potassium, flavonoids, etc that work in conjunction with each other improving the appearance of your hair’s condition. 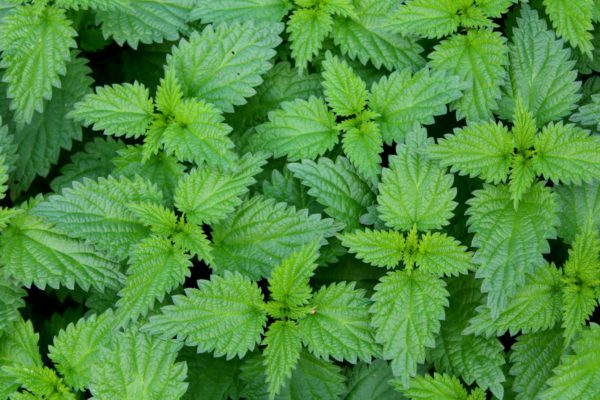 Also available in the bulk herb section at your local health food store, nettle is full of vitamins A, B, C, D, and K. It strengthens hair and restores shine. It is rich in vitamin A, B, C, D and K and is packed with proteins and amino acids. A generally good source of a variety of minerals that help improve the hair’s appearance. Contains vitamins A and E and omega-6. It seals in hair’s moisture, improves the appearance of keratin rich hair and restores shine. It also assists with scalp health and improves the appearance of dandruff. May help to balance scalp oil, combat dandruff and dry scalp, and moisturize the scalp and hair. It also contains many minerals, omega-3, and vitamins A and C.
This anti-inflammatory herb may assist with circulation, providing hair follicles with a steady blood supply. Rosemary infused oil moisturizes the scalp, and may aid with dry scalp and dandruff production. It may also reduce the appearance of grey hair, and adds shine. Full of oleic and stearic acids, and vitamins A and E. Works well at sealing in the hair’s moisture, and may protect against heat. Rich in vitamins A, B1, B6, and E, fatty acids & protein. May work as an anti-breakage moisture retaining oil that restores shine. It absorbs into the hair shaft and works as a sealant. We will first be infusing herbs in an oil, and then using that oil to create a hair mask. The infusion takes two weeks, so keep this in mind when creating! For the infusion: Combine the horsetail, nettle, and rosemary in your mason jar. Pour equal parts of the avocado, castor, sweet almond, and olive oil over the herbs, filling the mason jar to the top with oil. Feel free to make measurement adjustments to this step as needed. Place a lid on your mason jar, and place on a shelf, out of direct sunlight or heat. Let infuse for two weeks, and be sure to shake daily. After two weeks, strain the oil out through cheese cloth or a strainer, ensuring that none of the herbs make it into the oil. This will be your infused oil that you'll use to make the hair mask. To create the mask: Make sure the shea butter and coconut oil are at room temperature or slightly warmer (not liquified). 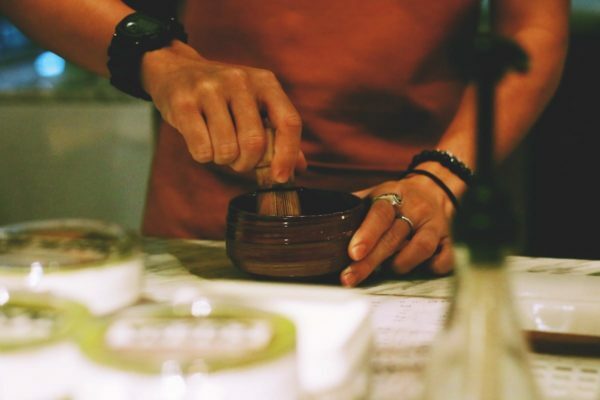 Break the shea butter into smaller pieces and place them into the bowl, along with the the coconut oil. Using your mixer, blends these ingredients until smooth. Then, add in your infused oil and peppermint essential oil and blend. The consistency should be frothy after it is blended. Place your mixture into your container (or applicator bottle if you prefer it more liquified) and allow it to settle and become more firm. If you have thicker hair, you can add more shea butter. It should be whipped, and have the firmness of cake frosting. Depending on the length and thickness of your hair, it is recommended that you section your freshly washed hair into 4-5 sections. Be sure to detangle hair prior to applying the mask. Make sure your hair is wet, then apply the mask to each section. I recommend starting with a nickel-sized amount and increasing as needed. Work it into your hair thoroughly from your scalp to the tip, making sure each section remains separate and detangled. Once the desired amount of the mask has been added to your hair, allow it to sit on your hair from 15-35 mins (depending on hair type and dryness). If you’d like to use natural heat for this mask, wear a shower cap under a wrapped towel on your head for the duration you’ve chosen to wear the mask. This recipe is great as an overnight hair mask. Rather than sleeping with a towel on your head, you can cover the shower cap with with either a hair scarf or t-shirt. You may want to cover your pillow with a towel, just in case the caps come off of your head while you’re sleeping. Starting with warm water, then finishing with cool water, rinse the mask thoroughly from your hair once your desired mask wearing time has completed. Finishing your rinse with cool water closes the hair shaft, locking in more moisture. Your hair will feel soft and moisturized. Allow to dry and style as usual. This mask also doubles as a daily moisturizer, if necessary. Just use a fraction of the portion that was used for the mask, and apply to either damp or dry hair. There is no need to rinse it out when smaller amounts are used. This recipe can also be used as an overnight oil treatment. This recipe may not work as well as a moisturizing mask for thicker hair. But the oil can be used with other moisturizers and leave-in conditioners for best results. Do you use hair masks? Share your favorite recipe below.